Snapchat users will soon be able to unsend messages to their friends. An update releasing in the next few weeks will enable this feature. Once the update has rolled-out, you will be able to long-press on any message, whether it's a text, image, video, sticker or voice note, and get the option to delete it. This can be done in one-on-one chats as well as group chats. The person(s) will be notified when someone deletes the message so it's not completely covert. For the feature to work, however, all parties need to have the updated version of the app. It also doesn't protect you from screenshots, although you will be notified if a screenshot is taken. 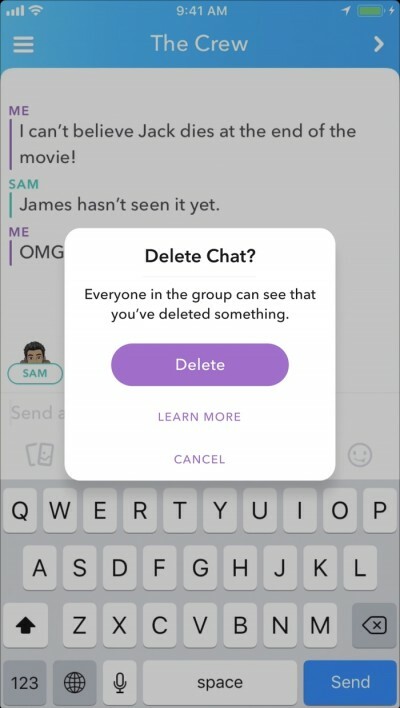 Snapchat was already a fairly private way of messaging since it deletes messages once they are seen and the notifications do not reveal the contents of the message. With this feature, you can be even more careful about what they share through the app. However, to be even more secure, Snapchat needs to enable some sort of screenshot blocking method the likes of which is used by video streaming apps to prevent people from exploiting loopholes. What about Facebook? Does someone remember how to use it? If Snapchat is history, then what is Instagram?